Interested in taking up pipe smoking? Have great memories of your grandfather (or grandmother?) smoking a pipe, filling the room with wonderful aromas? Then why not bring back those memories by taking up a pipe? Corncob - While common culture has tied the corncob pipe to hill-billies, it's use as a tobacco pipe is uniquely American. General Douglas McArthur was famous for his oversized corncob pipes. These pipes are generally inexpensive and easy to take care of and come with and without filters. One of the better brands is the Missouri Meerschaum Company with a popular (meaning less rustic looking) model being the Country Gentleman. 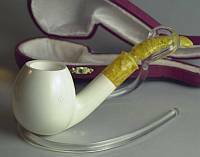 Meerschaum - Meerschaum is a light-weight porous stone mined in the plains of Turkey that is ideal for use as a tobacco pipe. The ability to carve the stone into a variety of shapes, along with brilliant white color of the stone, broadens the appeal of meerschaum to women. For a first-time smoker, there is less ongoing maintenance required with a meerschaum pipe than a briar pipe since there is no need to build up and maintain a protective carbon "cake" like on briars. The lack of a need for a cake adds another plus and that is the ability to jump among different types of tobaccos without problems. The downside to meerschaum is that they are more fragile than briar or corncob pipes and they burn hotter in your hand than briar. Briar - Briar is perhaps the most popular material for making smoking pipes. The wood, generally made from the root balls of Tree (or White) Heath. The dense wood is generally resistant to fire, is absorbent and acts as a good insulator. While resistant to fire, if you smoke a briar pipe, you need to build up a carbon "cake" on the inside of the bowl to help protect the wood. This means that you should really dedicate your pipe to a particular type of tobacco. You should also let a briar pipe "rest" after smoking it so it can dry out between smokes. Brands of briar pipes include Savinelli, Petersen, Bjarne, Castello and others. Choosing a pipe tobacco, much like choosing a favorite cigar, is a very subjective matter. Below we'll list the 4 basic types of tobacco blends and our recommendation as a starting point. Light Aromatics - Light aromatics are tobaccos that have been infused with other flavorings like Vanilla, Cherry, chocolate rums and whiskeys. This provides a bit damper smoke than English or Virginia blends will do but are less likely to give a new smoker "tongue bite"
Burley Blends - These are blends that are made mostly of burley, a type of tobacco. Unless mixed with light aromatics, this provides a great tasting smoke that provides a campfire or toast aroma to the smoke for those around you. English Blends - These are made from tobaccos that contain no artifical ingredients. Usually the will include the very smoky smelling tobacco called Latikia and Perique, which gives a peppery taste to the mixture. This is a very dry smoke. Virginia Blends - Virginia blends are usually sold as pressed or in flakes that need to be "rubbed out" before placing them in your pipe. These are very dry smoke, like the English Blends, but they take a certain patience to smoke as puffing too fast can give the smoker "tongue bite", an unpleasant burning sensation on the tongue, palate and/or throat. We've found that most people associate pipe smoking with light aromatics; the kind of tobacco that grandpa (or grandma) smoked that filled the room with smells of Cherry, Vanilla or other delicious flavors. We've found that most women will, at least initially, have the best luck and pleasure smoking a light aromatic blend and then branching out and trying other types as they gain more experience. The best way to find one you like if you don't have a tobacconist nearby is to order up a sampler pack and try out a few. For a great introduction on how to smoke a pipe, try this link. Yahoo! Group - Ladies of the Briar - This ladies-only group was created in 2004 especially for women to share in the passion of pipes, tobacco and cigar smoking. Sorry for the lack of links here. Most of the women pipe smoking sites I've been able to find are fetish sites. If you'd like to submit a suggestion, please use the Contact Us Page to send us a link for evaluation.